I really wish I had my finger on the button of politics, the way that Beastrabban does, here. I agree with what he says and, if the Blairites really do manage to push Jeremy Corbyn out of the leadership position, I hope he will show the way to everyone who agrees with his policies, whether that’s a split in the Labour Party, or a completely new Party being formed, I don’t mind. As long as he stands for the same policies as he does now, there will be thousands of us following him. At the present time, Labour isn’t an opposition force for the Tories, and we can thank the Tory-Lite PLP for that one! 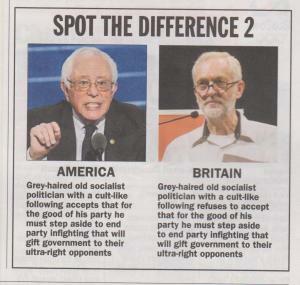 Last week I put up a piece commenting on the considerable anti-Corbyn bias in Private Eye. The Eye has run a series of articles attacking the Labour leader since he won the election, including a series of cartoons, mainly raking over controversies from the 1980s from the angle of the Blairites, entitled ‘Focus on Fact’. In its issue for 5th-18th August 2016, the magazine ran another series of pieces attacking Corbyn. One of these was the following satirical commentary. Grey-haired old socialist politician with a cult-like following accepts that for the good of his party he must step aside to end party infighting that will gift government to their ultra-right opponents.